IBM’s Uber Battery: Can it be real? A few weeks ago, I blogged about the Envia company, and its claimed breakthrough in battery technology. As you would suspect, lots of other people are working on battery technology with the aim of producing an all-electric car that will go 500 miles without needing to be recharged. One of the most promising efforts is IBM’s Battery 500 project. With the initial research begun in 2009 at IBM’s Almaden research labs in California, this past week IBM announced that it has built a prototype that demonstrates the efficacy of the technology. Wired Enterprise calls it the “Uber Battery,” a descriptor I stole for the title of this post. IBM is not doing this alone. It is collaborating with researchers in both Europe and Asia, along with universities and National Labs in the US. Nevertheless, IBM is the driving force, and the project is an outgrowth of IBM’s well-publicized investment in nanotechnology. It is difficult for a non-chemist to grasp the technology, but, briefly, the system works by using oxygen drawn from the air much as it is drawn into a conventional combustion engine. Inside the battery’s cells, the oxygen slips into tiny spaces that measure about an angstrom (0.00000000001 meters), and reacts with lithium ions situated on the battery’s cathode. That reaction turns the lithium ions to lithium peroxide, releasing electrons, thus generating electricity. For more information oriented to the layman, go to the following website and check out the videos. IBM credits much of the research advancement to the so-called Blue Gene supercomputers, used to analyze electro-chemical reactions to find alternative electrolyte materials that won’t degrade the battery while recharging. These computers, located at Argonne National Lab and in Zurich, Switzerland have rung up tens of millions of processor-hours on the project. 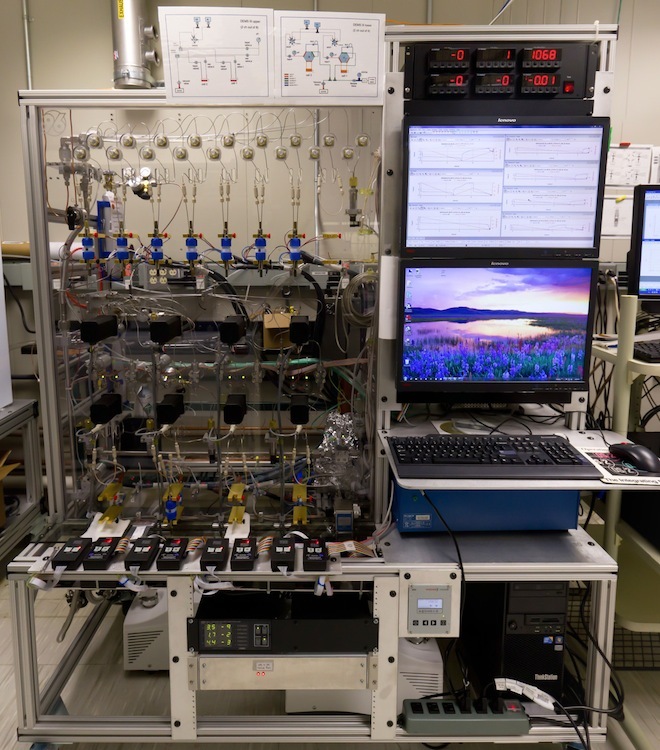 The computer modeling is being used to determine how the ions and molecules of different materials will interact. The hope is to find the optimum combination of materials that will permit commercialization of the technology. The downside is that it is not expected to be commercialized until at least 2020. In the meantime, auto manufacturers around the world are licking their collective chops. If this technology is successful, it will signal the end of imported oil in the US. The geopolitical implications are enormous. WHDI vs WiHD? VHS vs Betamax again? Read Anywhere Low Power Displays: Not Far Off? Olfactory Recognition and Synthesis: Does the Nose Know? Ultra HD: Worth the Wait?